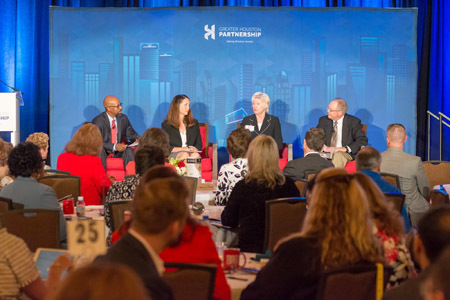 Upskill, a program of the Greater Houston Partnership (GHP) focused on the development of a competitive workforce in Houston, held a State of Talent Forum at the University Hilton on the University of Houston Campus recently. The program, from the opening panel to the concluding breakout panels, was packed with people and with pertinent information that was revealing in a number of ways. It was surprising to learn how many companies, non-profits, community programs, learning institutions and individuals are working to “upskill” the region’s workforce, and in turn, attract workers to meet the enormous need for skilled workers facing the Houston Region, the Gulf Coast, Texas, and the US. The keynote speaker for the Forum was Robert Kaplan, President, Federal Reserve Bank of Dallas who drove home the major factors impacting the “middle skills” workforce today and for the next decade. He gave the audience an economic overview of the US economy stating that there are short term gains that have driven the recent highs in the market, but they are debt driven and ultimately the cycle will adjust. He expressed the Fed’s concern over the “out years” since the US is, in economic terms, “overleveraged” and how the economy might react to any dip or downturn. Dr. Kaplan spoke directly to the need for “skills based” and “employer based” immigration to be increased in order to meet the need for the middle skills workers. He said that there is a definite difference between immigration and workforce and that “workforce” immigration would have to be expanded in order to have a healthy economy in the next decade and beyond. To support that statement, he mentioned the “aging” demographics and the growing need for more middle skills workers. That played well to the Upskill audience, many of whom from the education arena or from business are deeply involved in the development of the middle skills future workforce. Kaplan said that he was concerned that currently over 40% of the middle skills workers are immigrants, and looking forward, stated that “immigrants and children will make up 100% of the new workers over the next 20 years” in the US. That statement was a wakeup call for those in the audience who do not track the workforce trends on a daily or weekly basis. Kaplan’s message was built on the foundation laid by the speakers and panelists throughout the morning. Dan Gilbane, Sr. Vice President of Gilbane Building Company and chair of the Upskill Houston Executive Committee opened the day with an overview of Upskill and the importance of having the UpskillWorks Forums to bring the stakeholders together for an active exchange of programs that are underway and to spark new ideas for collaboration that would lead to a sustainable strong “middle skills” workforce for Houston in the future. The initial panel, moderated by Frazier Wilson, Ed.D., VP Shell Oil Company Foundation and Manager, Social Investment, Shell Oil Company included Andrea Hodge, Pre-Apprentice Manager at Trio Electric Company, a company that is on the leading edge of working with local school districts whose high school students are interested in the possible career opportunities in the construction industry. Trio holds two week long “boot” camps where students work in the pre-fab shops on equipment that they then “help” install on a Trio jobsite. The company is partnering with Houston Community College on certificates for the Trio “helpers” to achieve an associate degree and further their careers. The panel included Tammy Newman, Vice President, Global Technology at JPMorgan Chase who stated that “JPMorgan sees itself as a technology company not a bank” and who told the overflow crowd that they are working with Houston Community College and the Department of Labor on a one-year program to recruit 43 candidates for their IT and cybersecurity teams. They are looking for former military and for adults who are “re-skilling” and “upskilling” to work in one of the five occupations in the program. David King, Special Projects & Workforce Manager at Ineos and incoming chair of PetrochemWorks, a program supported by the East Harris County Manufacturer’s Association or EHCMA, JPMorgan Chase & Co, the Council for Adult and Experiential Learning (CAEL) and the Association of Builders and Contractors (ABC) who told the audience about the PetrochemWorks program and its collaboration with nine community college districts in the Houston area to develop programs for women and former military individuals who can work in the Oil and Gas industry in the Houston Region. The program works with the GHP and has adopted the US Chamber of Commerce Center for Education and Workforce program to enhance the workforce skills needed to meet the rigorous standards in the Chemical, Oil and Gas industries. Bureaucracies are holding the programs back. The students are really engaged. These programs have profound and life-changing impact on the candidates, their families and the companies. These programs take focus and energy over time to be successful. The programs must have sustainable processes in order to be successful for the companies. The champions of these programs and even the companies must have the stamina and commitment to stay on course. One of the key points was the ability to get the DOL programs extended so that the companies can offer the programs to underage workers. That move alone has extended the program offerings to the early teens when they are being asked to define which track they will take in the later high school years. One of the panelists made the point that it is most important to, early in the process, define expectations and to explain diversity and cultural differences that many of the frontline managers might not expect. Another critical point made throughout the day was the importance of teaching the “soft skills” to every candidate accepted into these programs. Due to the cross cultural, multi-generational and even compliance issues, the monitoring and teaching of the soft skills in an organized manner, the interpersonal skills are rising in importance. One of the panelists said that they have made it clear that they want the colleges and schools to teach the soft skills before the candidates come for the interview. There were two afternoon breakout sessions. Employer Community Partnerships moderated by Dorian Cockrell, Senior Manager at United Way Thrive. This session examined some of the more innovate collaborations and the work being provided by the United Way Thrive program, SER and other community-based organizations that are major players in the upskilling and re-skilling programs. It also touched on ways that business and the community-based organizations can collaborate on building the middle skills workforce in Houston. Developing the Craft Workforce in Schools moderated by Chuck Gremillion, Executive Director of the Construction Career Collaborative or C3. This session examined several of successful companies' efforts as well as the current status of the CTE programs in the various schools and colleges in the Houston Region. It was clear that these issues are complex and have many moving parts to be addressed and that many collaborations are needed in order to connect with potential workers early in their high school years. It was spelled out by the education community that businesses must continue to create and sustain the collaboration and contact with the community colleges and school districts, many of whom are building new technology centers where businesses and students can interface so that students can better understand what the skilled worker’s career really is like. This UpskillWorks Forum was a success in defining and illustrating leading edge programs to help develop a sustainable “middle skills” workforce for the future in the Houston region.